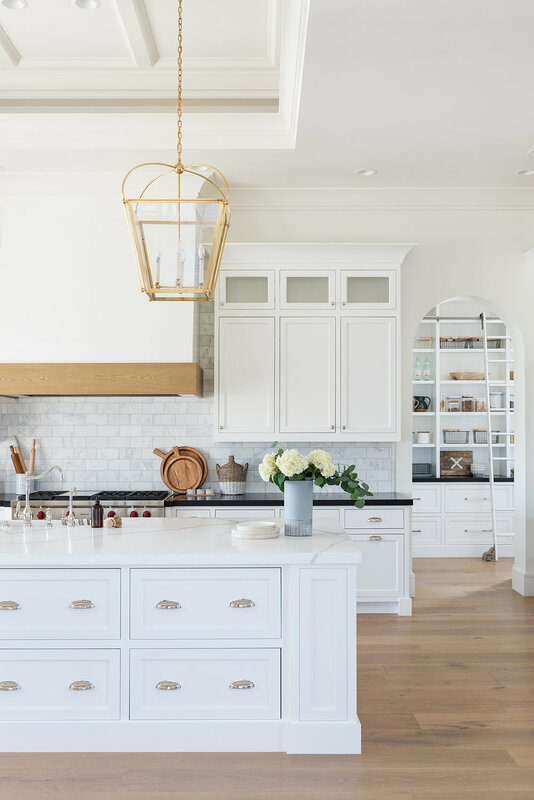 Today we’re back in California, and we’re giving you a tour of this traditional, beautiful home. You might recognize this home as the host to our latest new arrivals shoot. Enjoy a stunning kitchen, laundry room, and the dreamiest bathrooms! You can shop each space by hovering over our shoppable images throughout the post! 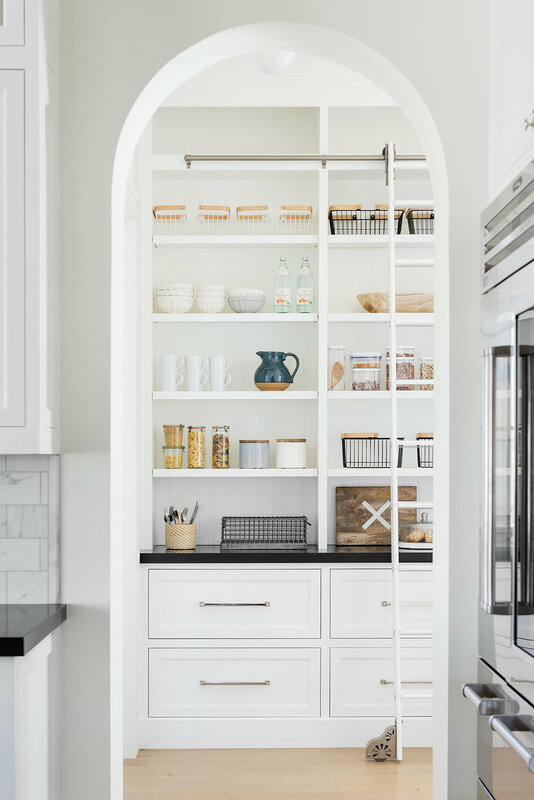 Lanterns frame a beautiful range hood, and we can’t get over the archway into that pantry. There is nothing like well stocked pantry, or a well stocked home. The muted tones in this pantry are brought to life with the right accessories and vintage inspired artwork. 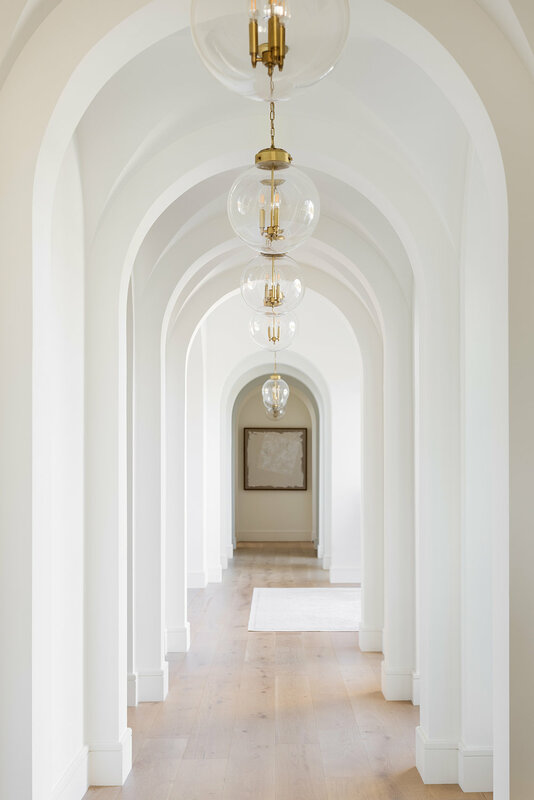 This house is full of the dreamiest archways. Globe pendants line the hallway, and draw your eyes to beautiful artwork at the end. 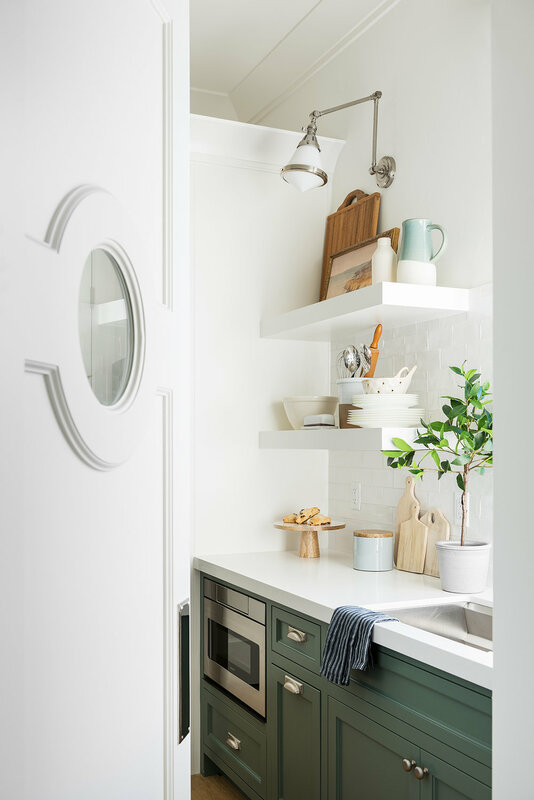 This corner kitchenette is full of function. 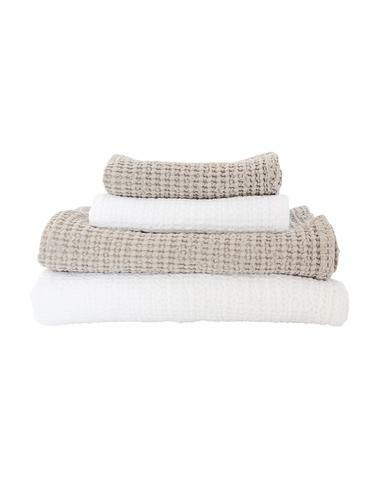 With a built-in rod, and bonus storage space above there is plenty of room to display your prettiest objects or store folded towels. This moment by the tub is everything. 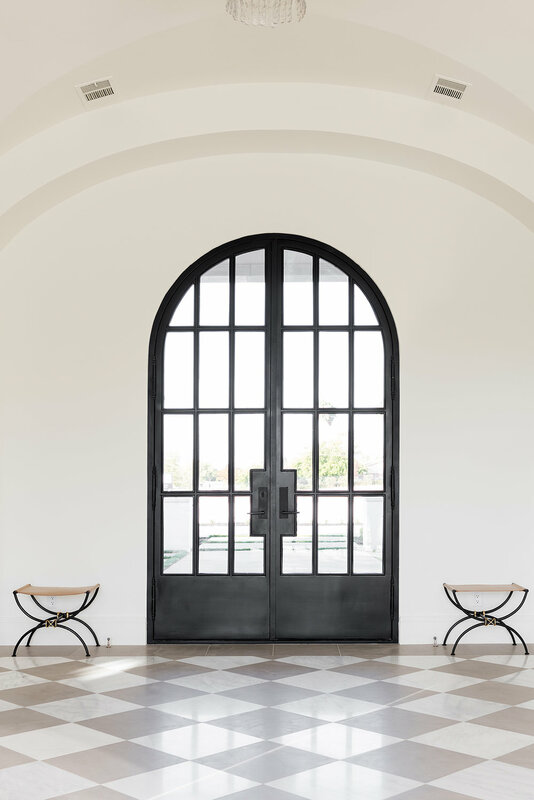 A custom door and simple, serene accessorizing creates a space made for pure relaxation. We placed a Joel Stool next to the tub, and brought the corner to life with a basketed olive tree. The finishing touch is the beautiful hanging pendant. We carried the Chloe Stools from the bathroom to this entrance to frame the doors. We love to create custom vanities because it gives us opportunities to add shelves in the lower section, and a unique blue color. Our favorite detail in this bathroom, is the marble that carries up and behind the wall-mounted faucet. The brass knobs bring out the warmth in the veining, so we complimented the space with gold accessories. A dark vanity against dark grasscloth makes the boldest statement, especially in a small space like a powder bath. We created warmth in this bathroom by contrasting finishes. 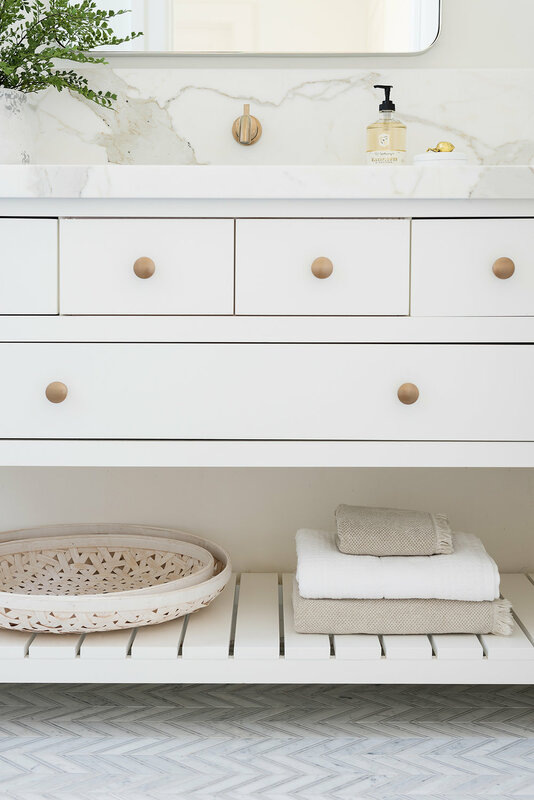 The brass knobs and tiled hexagon flooring do all the talking, so we kept accessorizing natural and minimal.